Hey Everybody, welcome to Tristan and his WHITEBOARD LIVE! And, as you can see, this is what happens when your daughter comes over after school and decides to draw on the whiteboard. Quite entertaining. I was kind of wondering why the dog looks like a centipede with a number of different legs. Anyway, lot of fun for everybody but we’ll erase that for now. Alright. Today we are going to talk about closing costs. First thing, of course, on the list is what are closing costs? Closing costs are those funds needed by the lender and the closing department to complete the loan. They include things such as origination fee, the appraisal, the closing fee at the title company itself. all of your recording fees, etc, etc, etc. Everything that we need to take care of the of the loan process and getting it closed. The other part of closing cost that we don’t often talk about is the prepaids such as insurance. You always have to pay in advance for your insurance, so that whole amount gets paid upfront at closing time. Also, the lender is going to take out 2-3 months’ worth of taxes and 2-3 months’ worth of insurance to kind of have a cushion for later on when they start paying those payments out for you after you buy your property. Typically speaking, the closing costs end up being around 2-3% of the purchase price to get all those fees taken care of. We’re going to talk to the sellers first regarding these closing costs the buyer has. If you’ve got a property around or under $250,000 dollar price point, you can expect that buyers are probably going to ask for closing costs. Here’s the deal – the buyer has to come up with 3 to 3 1/2% down payment (probably). Then they also have to come up with another 3% for closing costs, potentially. Not a lot of…buyers don’t have that. They don’t have that much cash put away to do that. So, to purchase your home, you may have to give some money to the buyer to help them purchase your home. Unfortunately, this is the way things are right now. It’s pretty common place for that to happen. Not a lot of people have 10% in their accounts to go ahead and use for down payment and for closing costs. Just expect that that could be in the offer. Now it is completely negotiable. They can say, “You know what? I want three percent for my closing costs.” You can come back and say, “No, we’ll give you two percent.” Or “No, we’ll only give you one percent” or “I’m going to give you 500 bucks.” It is completely negotiable item. But just know that if the buyers are cash strapped, they may not be able to purchase your home at all unless you help them with all of their closing costs. Depending on the type of buyer and where you’re at. Those things can happen. Also know that closing cost money isn’t like coming out of your pocket right away. If they ask for five thousand dollars for the closing costs, you’re not reaching your wallet and pulling out of five crisp thousand dollar bills. Like you know, we all have in our wallets…. That will just come out of closing at closing. So instead of getting $100,000 dollars cash, once everything was said and done, you’ll only get $95,000. At closing, they take that five thousand dollars from your account, move it over to the buyer’s account. You won’t exactly see it aside from that amount subtracted from your total amount coming out. Okay that makes sense? So, some people have thought, “Hey I got to pay five thousand dollars cash for these people? Forget about it.” It does come of closing, still coming out of your total proceeds, but possibly a necessary item to help get your property sold. Okay FYI! Now number three, of course, we’re going to talk to you buyers. As probably you have understood, the sellers may not have a lot of interest in helping you buy the home with the closing costs that they may have paid themselves when they bought the home back a few years ago. There are already looking at spending “X” amount of money for the realtor fees. Plus, then also spending money to help you get in the home, isn’t always a fun prospect. Let’s say you ask for $5,000 dollars to help pay closing costs, and you come in under $10,000 dollars the asking price. The sellers are looking that as asking for $15,000 dollars low. That’s just what they’re going to see, okay? Cuz they’re looking at their bottom line, right? So, you need to be considering that, as well, when you make that offer. If you need a considerable amount of closing costs you may need to offer closer to the asking price. Sometimes we’ve done it before where we’ve given a little higher over the asking price to pull in some of those closing costs. That is an option. Something we may have to talk to you about to see how that might work for you. The other thing you might not need to consider is if you’re working with a bank or lender that has a high amount of closing costs…there are other lenders in town that have lower origination fees. They have lower closing costs and still do a very good job with getting the process done. I’ve worked with a few of them. A lot of them will help you in that process. You may need to consider going to a different lender that offers a lower closing costs. And of course, make sure that you check that the interest rates are the same and all the other things so that you have a better chance of purchasing a home. Especially in a tight market where, if you are competing with a number of other offers, and you need a lot of closing costs. If somebody else needs few (closing costs) or none at all, the chances are you’re not going to win out in that scenario. So, in a tough spring market, especially in Rapid City, you might need to consider moving to another lender. You might need to consider not asking for ALL the closing costs. Maybe you can spend a few more thousand on the closing costs and only ask for a certain percentage. There are also some down payment assistant programs that you can – possibly – look into. These might help cover your down payment, so you’ve got more cash to play with your closing costs. All these different options to hopefully get you into the property without having a whole lot of closing costs to offer. If you need all your closing costs paid for, ask for it. See what happens. You can always do that. I hope that clears up any questions I got for you about closing costs. Of course, every situation is different and unique. Make sure you talk with your lender and your realtor about how you can make it best for you and your situation, whether you’re the buyer or the seller. Alright. 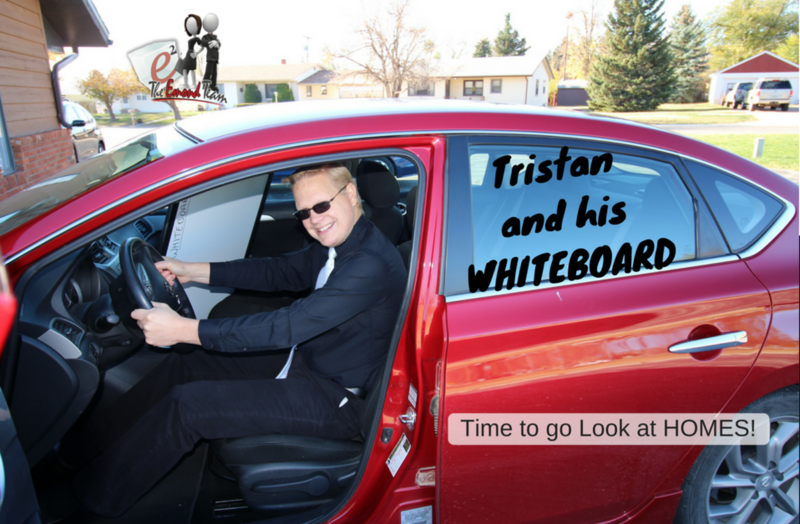 Thanks so much for watching Tristan and his WHITEBOARD LIVE! We’ll talk to you next time! Have a great day.